GWT XML (eXtensible Markup Language) uses custom tags to describe data and encode the data into plain text. It is more flexible and easy to work. To parse the XML text we have to first parse the raw XML text into XMl DOM structure. DOM structure helps in navigation of the data. XML parser is located under XMLParser class. XMLParser class consists of parse(String) static method which is called to parse the XML and return a Document object. To handle an error occurred during parsing (for example, if the XML is not well-formed), then XMLParser will throw a DOMException. If parsing succeeds, the Document object we receive represents the XML document in memory. element: <someElement>Here is some text.</someElement>. XMLTools() It constructs different tools option. disableIEXMLHackaround() It disables an Internet Explorer-specific work around for the MSXML bug that the 'xml' namespace prefix cannot be explicitly declared. loadWSDL(String wsdlURL, WSDLLoadCallback callback) It loads a WSDL file and create an instance of WebService that allows invoking operations and binding DataSources to web service operations. loadWSDL(String wsdlURL, WSDLLoadCallback callback, RPCRequest requestProperties) It loads a WSDL file and create an instance of WebService that allows invoking operations and binding DataSources to web service operations. loadWSDL(String wsdlURL, WSDLLoadCallback callback, RPCRequest requestProperties, boolean autoLoadImports) It loads a WSDL file and create an instance of WebService that allows invoking operations and binding DataSources to web service operations. loadXMLSchema(String schemaURL, XSDLoadCallback callback) It loads an XML file containing XML schema definitions and create DataSource and SimpleType objects to represent the schema. loadXMLSchema(String schemaURL, XSDLoadCallback callback, RPCRequest requestProperties) It loads an XML file containing XML schema definitions and create DataSource and SimpleType objects to represent the schema. nativeXMLAvailable() It returns true if the current browser exposes an XML parser that can be used for Smart GWT XML operations like web service bindings and XML processing. selectNodes(Object element, String expression) It retrieves a set of nodes from an XML element or document based on an XPath expression. selectNodes(Object element, String expression, Map namespaces) It retrieves a set of nodes from an XML element or document based on an XPath expression. 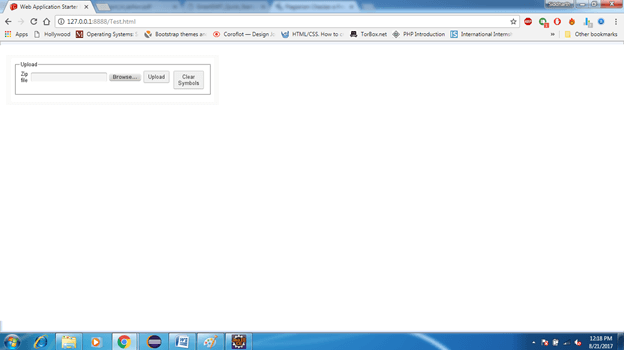 In this section we would be creating an upload panel with GWT File upload and Form Panel widgets. It allows user to upload zip files to the server. To store the information through xml we design the frontend from two panels which are UploadPanel, and DataStorePanel. In this widget we create form to upload the file and button to clear the symbol list.